Daylily flowers are highly variable in their size, shape, color, and fragrance. The name is a generic one and refers to many cultivars of plants in the Hemerocallis genus; there are over 60,000 cultivars of daylilies. 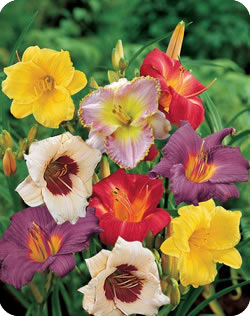 Most day lilies will bloom once and the flower only lasts for one day. However, it is possible to have multiple flowers on the same stalk, each opening on different a day. Interestingly, some daylilies bloom at night. • a rounded flower with curled petals and hardly any angles. 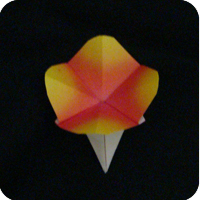 This origami flower is not hard to make, but it does have a divide-by-three step which may be challenging. 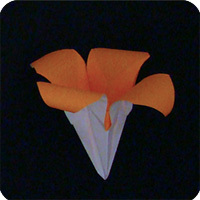 In this web site, this flower along with the traditional lily are the two flowers which take the longest time to fold. Fold the paper along the diagonals (in both directions). 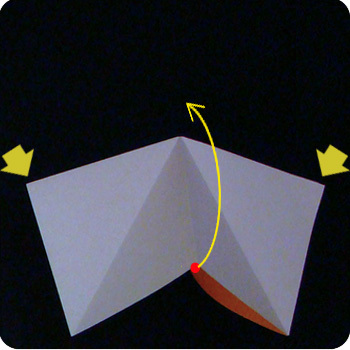 Unfold to give you an “X” shaped crease. 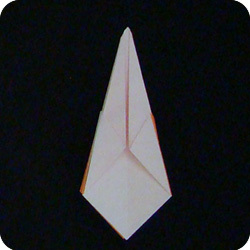 Fold from left to right. Gently push together the top-left and top-right corners of the paper. 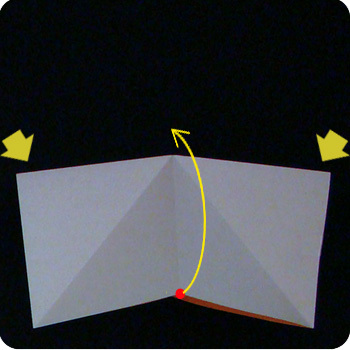 The top layer of paper will lift up as you push together the corners. 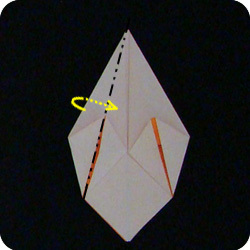 Swivel the front-flap of paper towards the right. Behind the model is another flap which points back. Swivel this back-flap towards the left. 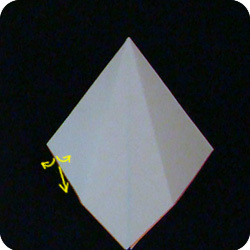 This shape is called a “Preliminary Base” and it is an intermediate step found in many origami models. You will need to trisect the top angle. 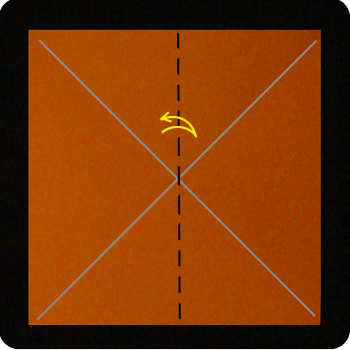 This is to say, imagine that this is a pie and you have to cut it into three equal parts. 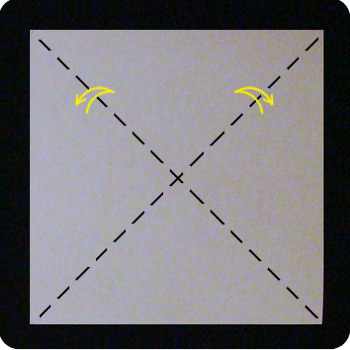 See dotted lines. 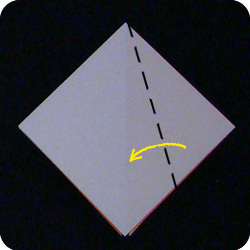 Work with the top layers of paper only: fold the right-edge of the paper so the crease falls on the imaginary dotted-line from previous step. 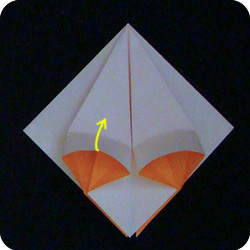 Fold the left-edge of the paper overtop the right flap. 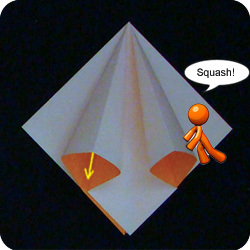 Next, we will make a Squash Fold. 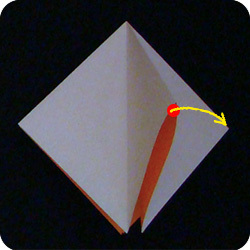 Pry open the two layers of paper. Do the next few moves on both left and right flaps. 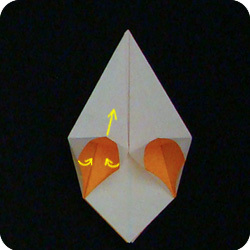 Carefully press down (or squash) the top of the paper. 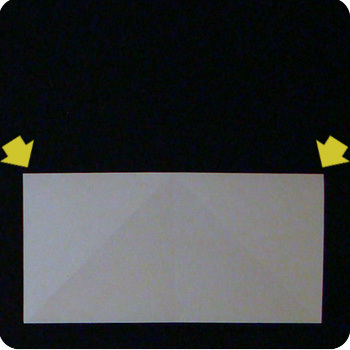 Align the top-crease with the edges of the paper so you can squash evenly. This is how it looks after the squash is complete. Next we will do a Petal Fold. Work with the top layers only: fold the bottom-left and bottom-right edges of the paper to the center as shown. Lift the center of the top-most layer. Fold the sides in along the crease made in step 10.
until it lies flat as shown. Mountain fold along the dash-dot-dot line as shown. 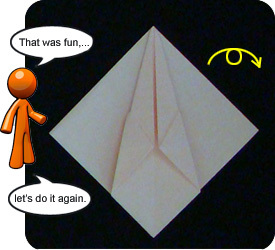 Basicaly, you fold back half of the flap and tuck it behind. 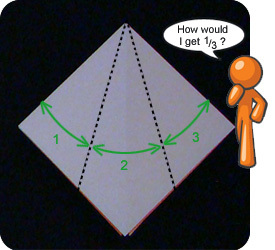 Turn the model over and repeat steps 6 through 12. Fold the left-edge and right-edge of the model inwards to trisect the top angle (fold into thirds). 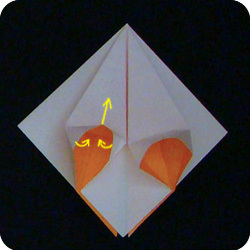 Squash fold: peel open the two layers of paper and squash down. 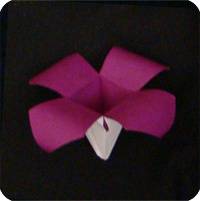 Petal fold: fold the bottom-left and bottom-right edges towards the center as shown. Unfold. Lift and pull back the top-most layer of paper. Fold in the edges of the paper along the crease made in step 16. Pull back completely and press flat. Mountain fold as shown and tuck paper behind. This is how it looks like when done. 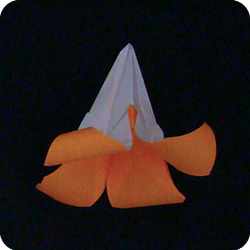 Curl the paper around a pencil to make petals. 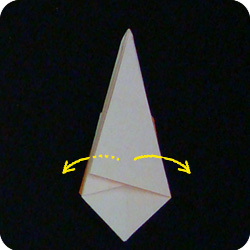 Or, you can fold back the paper as shown below. 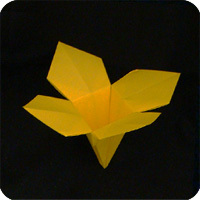 This is how the origami daylily looks like when all 4 flaps have been curled. 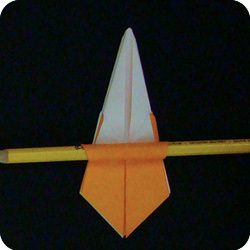 Instead of wrapping the paper around a pencil at step 18, you can also fold back the paper. 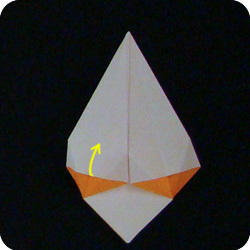 This makes the origami daylily more angular with square center and flat petals.